Here’s a quick tip to increase the usability of your LinkedIn profile to visitors and to increase your company’s online presence. It has to do with how you list your company as the place where you work. It can be listed as just plain text or it can be a link to your company’s LinkedIn page. If you visit my profile at Jared Pomranky LinkedIn, besides noticing that I should probably update my picture to show my beard, you’ll notice that the name of my company under “Current” is underlined. Hovering over the name will produce the pop-up that I’ve outlined in red (picture to the right) and you can click on it to view the company page. This is a small update that you can make to add some interactivity to your profile. First you need a company page. Don’t have one yet? You can visit Add Company to LinkedIn to add it. Once you’ve added your company (or if you already have a company page), you can go into your Edit Profile (Profile->Edit Profile) and go into any section that mentions your company (Current Position, Experience) and click on the Edit button. You’ll see a screen similar to the one on the left. Click on “Change Company” to retype your company name, start typing your company name, and you’ll see suggestions that are company pages on LinkedIn. Select the company page you created for your company, click on Save, then you’re linked! Some people may have difficulties finding your company name. Just try retyping your company and clicking on Save. An added result is that you get your personal profile listed under your LinkedIn company page so people can find you by looking for your company. This is a quick update but it should help connect you better with your company. 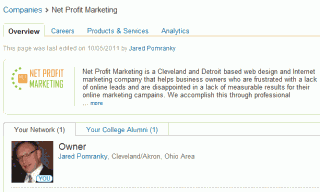 You can see this by viewing our Net Profit Marketing LinkedIn page. Alright sweet – I’ve been looking for this! BTW – I’m loving the video on your homepage! I tried this but it still doesn’t work. Do you have any idea as to why it won’t link even when I click the company? You edit your profile, select the company, and it doesn’t show up? 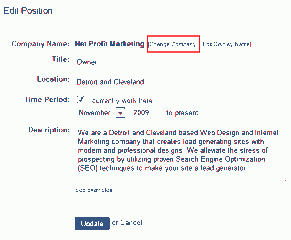 If you already have your company name entered and it’s not linked, you have to click on change company and retype the company to find your company page. Once you click on it and select save, it should be linked. If this didn’t answer your question, let me know exactly what you’re having issues with. I have tried that as well. I press change company, I press the suggestion but it does not link. Is there something I am missing? That’s very nice, except I’ll type the name of my company in the box and all I get is suggestions which have nothing to do with my company and I have nothing to click on and am thus unable to link. Did you know there is currently no ‘change company’ button? 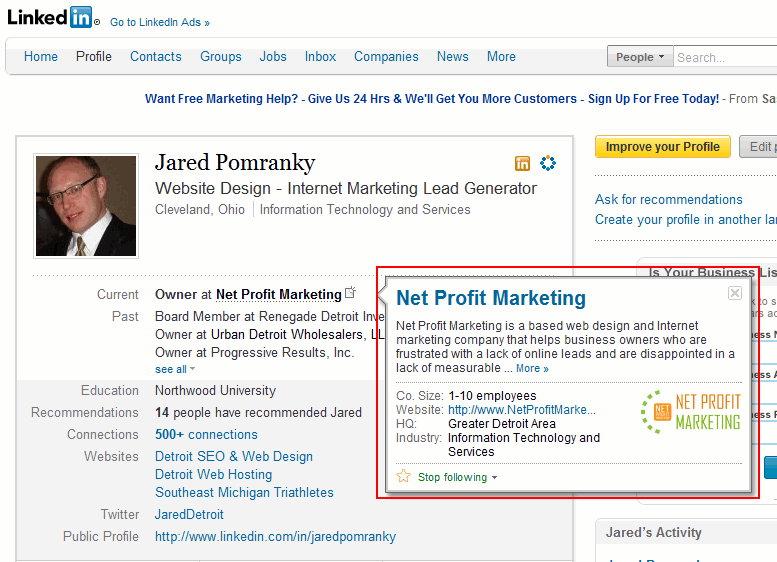 Do you know if there is a new way to link the company name on your personal profile to the LinkedIn company page? I’ve tired on multiple browsers and OS’s with the same result. Thanks! I created a new profile on LinkedIn to test this out and what I saw was that there is a difference between my profile and the new profile I created. 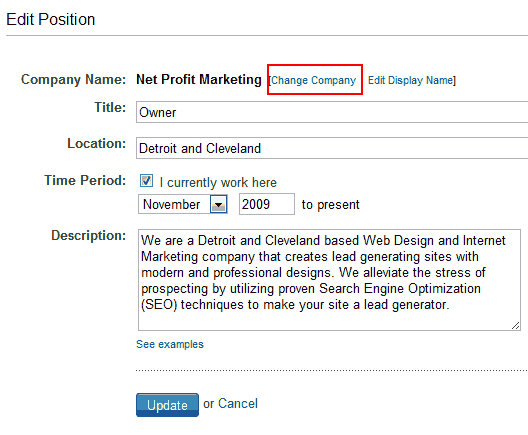 On my old profile, there is no longer a “change company” but on the new profile there is when adding a new position or editing an existing one. Odd. Also, on my old profile I didn’t receive any suggestions when adding a position. 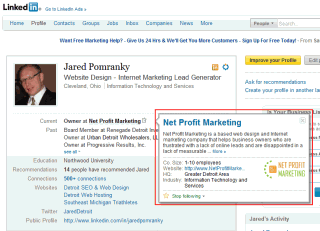 LinkedIn help answers reference clicking change company (link). On the new profile, I typed in the name of my company “Net Profit Marketing” and no suggestions came up for it. I left it as plain text, clicked on save, and when viewing my profile, it linked automatically. It must do a search for company pages for the link. If your company doesn’t come up, make sure you type it exactly the same as your company name and it should link, as long as you have a published company page. Yes but once you’ve created a company page from your personal page and have logged out then say next day logged in again, how do you navigate to your company page from your personal page? There is no way that I can see. Totally rubbish design and usability. I have to paste in the link of our company page to get to it. Cr*p! It seems that they’re making some updates but it’s hit or miss on getting this to work. If you look at my profile, Jared Pomranky, you can see that it doesn’t link from my title but it links under my experience.